When temperatures turn to freezing and black ice forms a dangerous coating on the driveway, it’s imperative that the problem be taken care of quickly. Black ice is sometimes also referred to as “glare ice” or “clear ice.” Black ice is clear, not black, but is given its name because it’s so thin that pavement shows through clearly. This makes black ice even more dangerous than regular ice because it’s practically invisible, giving a wet appearance instead of an icy one. Sprinkle table salt on black ice. Table salt is sometimes also called sodium chloride or NaCl. Keep in mind, though, that this remedy won’t work if the temperature is very low. Sprinkle calcium chloride on black ice if temperatures are extremely low. While this alternative doesn’t cause as much damage as table salt, it’s the more expensive option. Spread an “ice melt” product over the ice. Layer on more if the ice doesn’t respond. Potassium chloride is one recommended type of ice melt. Break up the ice with a pick and shovel. Toss manageable chunks of ice off of the driveway. Make sure that when the ice melts, it won’t run back into the driveway. Wait it out. Since black ice is so thin, it often melts quickly once sun shines on it. However, if the driveway is shaded, it won’t warm up enough to melt on its own. Install a radiant heat system under the driveway’s concrete. This is a great option for homes in areas that often get hit with snow, ice and freezing temperatures. The heating system won’t damage concrete or vegetation, and can work with either hot water or electricity. The best defense against black ice is to prevent it before it forms. Chemical products called deicers can be sprayed on the driveway before snowfall. Not only will this help keep black ice from forming, but it will also make snow removal easier. 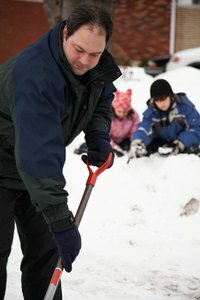 Avoid making ice formation worse by removing snow from the driveway before driving on it. Tire tracks will only pack snow down, causing ice to form more quickly. While many people turn to salt for ice removal, it’s important to keep in mind that salt will not only damage concrete, but the environment as well. Table salt is known to cause damage to plants and to get into the local water supply.